While much of Chiloé is uninhabited during the rainy winter months, the Parque National is still open, lush, and beautiful. 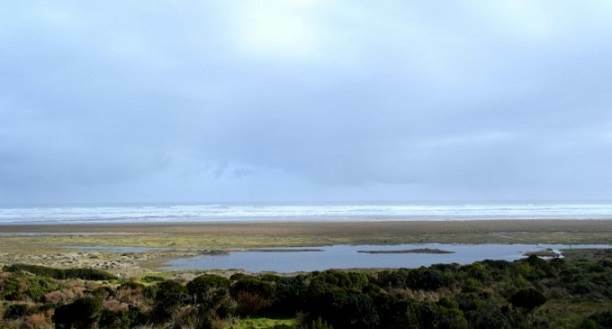 The park is located near the pueblo of Castro, the capital of Chiloé. Unfortunately, one of the Parques in Chiloé is privada so before making the journey be sure that you are going to the public park. The easiest (and without a car, only) way to get to the park is by bus. There are many easily accessible bus stations around Castro that have trips leaving hourly. The trip is around an hour and a half but it is easy to sleep on the bus or enjoy the green countryside visible through the windows. Or make new friends! Once inside the park, there are many different routes and trials that one can enjoy. The small museum right inside the main entrance has maps for tourists that show where all of the trails go. A day trip is best because it will allow enough time to see most, if not all, of the park. The park has a lake, forestry, and also a beach. When I was in Chiloé, my friends and I began by taking the path through the woods, which also leads around the lake. We were lucky enough to see a wild horse right after our arrival. The route we took was an easy stroll and not too long. There are small signs that discuss the plant life seen in the park along the trails and exquisite views of both the lake and also the greenery. After, we headed to the opposite side of the park to enjoy a picnic lunch with a full view of the ocean. Actually getting to the ocean is possible in the park but it is a bit of a strenuous hike. Personally, the view was enough for my group. While we did not venture all the way to the beach, we did decide to be a little adventurous and rent kayaks for the lake. There is a darling café in the park that offers food and drink as well as a warm fire to curl up next to during the winter. This is also where kayak rentals take place. Single kayaks can be rented for an hourly rate of CL$4,000. While we were warned that the middle of the lake could be a bit choppy, the edge was nice and flat. The lake itself it huge and would take multiple hours to kayak the entire outer perimeter. Instead, my group pulled our kayaks up into the shore next to a quaint park and picnic area visible from the water to relax for a little while before kayaking back. Be warned: kayaking in the late afternoon in the winter will get you wet! Paddling back was both choppy and exhausting. It is not for those who lack upper body strength or stamina. But, if you are up to the challenge, I highly recommend it, as well as bringing a change of clothes for afterwards. If you would like to experience the park for more than one day or miss the last bus back, there are cabins that can be rented. I would recommend renting a cabin in the summer when it is warm and lively. There is much to see and do in the Parque National for those nature lovers out there.